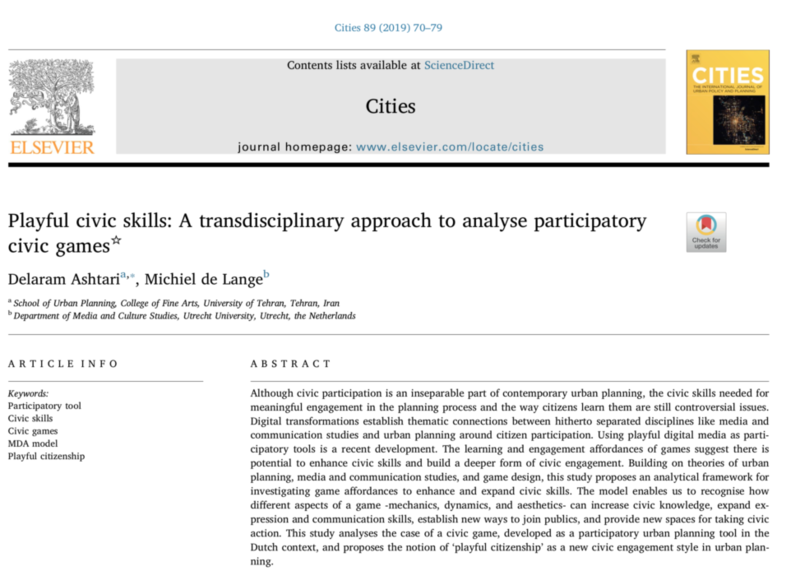 Visiting PhD scholar Delaram Ashtari and I wrote a paper “Playful civic skills: A transdisciplinary approach to analyse participatory civic games”, about a playtest session we organized in Utrecht on Nov 20 2017, with the help of Tessa Peters & Rolf van Boxmeer who created the urban planning game Redesire. Although civic participation is an inseparable part of contemporary urban planning, the civic skills needed for meaningful engagement in the planning process and the way citizens learn them are still controversial issues. Digital transformations establish thematic connections between hitherto separated disciplines like media and communication studies and urban planning around citizen participation. Using playful digital media as parti- cipatory tools is a recent development. The learning and engagement affordances of games suggest there is potential to enhance civic skills and build a deeper form of civic engagement. Building on theories of urban planning, media and communication studies, and game design, this study proposes an analytical framework for investigating game affordances to enhance and expand civic skills. The model enables us to recognise how different aspects of a game -mechanics, dynamics, and aesthetics- can increase civic knowledge, expand ex- pression and communication skills, establish new ways to join publics, and provide new spaces for taking civic action. This study analyses the case of a civic game, developed as a participatory urban planning tool in the Dutch context, and proposes the notion of ‘playful citizenship’ as a new civic engagement style in urban planning. Read the paper here: https://authors.elsevier.com/c/1YSL5y5jOZCcN.